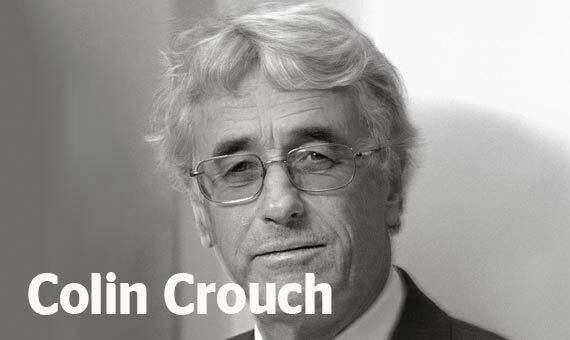 Colin Crouch is a professor emeritus of the University of Warwick and external scientific member of the Max Planck Institute for the Study of Societies at Cologne. He is vice-president for social sciences of the British Academy. He has published within the fields of comparative European sociology and industrial relations, economic sociology, and contemporary issues in British and European politics. His most recent books include Making Capitalism Fit for Society (2013); Governing Social Risks in Post-Crisis Europe (2015); The Knowledge Corrupters: Hidden Consequences of the Financial Takeover of Public Life, 2015. European policy strategy has shifted from maintaining a balance between expanding market forces and social development policy to an attitude espousing a neoliberal insistence for deregulation and the strengthening of markets. This change has had negative consequences for employment and labour policy. The relationship between consumption and job security has not been adequately addressed, and the implications of risk and uncertainty for the distribution of income have not been determined. Nor is there any response to the consequences of mass migration following the admission of new member states from Central and Eastern Europe.